In the tweet, Cook thanks all the inspiring women he works with at Apple, as well as "every woman who fights for equality." Cook elected to include a quote from Malala Yousafzai, a well-known campaigner aiming to increase the access of education for girls in developing regions. The quote reads: "There are two powers in the world; one is the sword and the other is the pen. There is a third power stronger than both, that of women." In January, Apple revealed it pledged support to the Malala Fund, which is expected to help double the number of grants provided by the fund's Gulmakai Network, which supports education programs in Afghanistan, Pakistan, Lebanon, Turkey, and Nigeria. Apple is also helping the organization scale up by assisting with technology, creating a curriculum, and research into policy changes to help girls attend school and complete their education. Cook has previously called Malala a "courageous advocate for equality and one of the most inspiring figures of our time." The Twitter posting joins the variety of other ways Apple is marking International Women's Day. 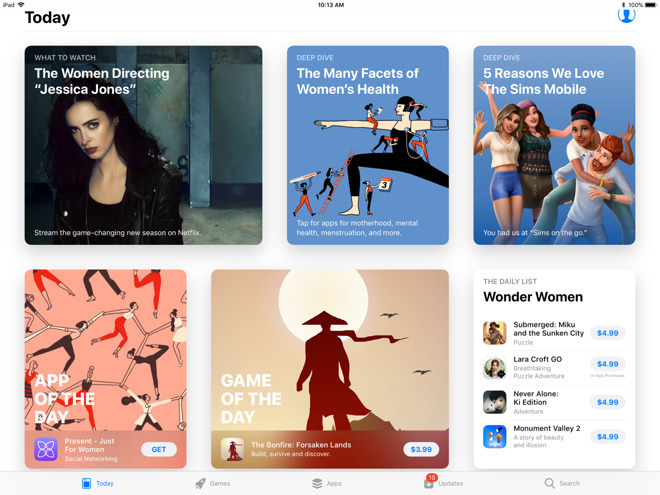 In the App Store in the U.S., it is highlighting apps and services with a focus on women, including health apps, the women-only social network Present, and a feature on the women directing Netflix's female-led "Jessica Jones," with Apple Music and iTunes Movies promoting content in a similar vein. Apple Watch users can take part in a special challenge taking place throughout the day. To win the challenge, and receive the "2018" International Women's Day Challenge badge, users need to complete double their normal Move goals before the day ends. Apple is also holding events in some of its retail outlets in honor of the day, including a recruiting event in its Paris Marche Saint-Germain store, and talks and a coding event at the London Mayfair store held in association with She Can Code and NetMums. On Wednesday, Apple's annual Supplier Responsibility Report announced a new women's health initiative, starting at supplier facilities in China and India. The initiative includes a curriculum that provides information on self-examination for early cancer detection, nutrition, personal care, and maternal health, with access to services required to maintain proper health also offered.